Announce your baby's arrival or christening to friends and family in style with one of our beautifully designed birth announcement cards. 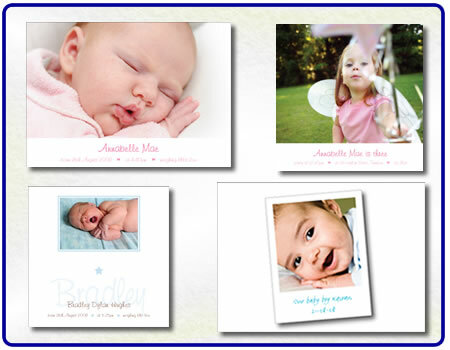 or choose from our selection of photo cards for personalised invitations and thank you cards. All of our announcement cards are fully customisable with your photos and text and are digitally printed onto heavyweight 300gsm white board, supplied complete with 100gsm quality envelopes. To help our customers in this credit crunch. We have also reduced our prices to our promotional launch price to view our prices please click here. Click here to check out our testimonial page! If you do not see what you are looking for you may email us your requirements or place your order for a similar design and advise any 'tweaks' in the 'special instructions' section and as artwork and production is on one site in the UK we can create the perfect card for everyone! All orders are professionally typeset, every picture is checked for quality. We work hard to be the best at what we do and take pride producing every order to the highest quality we can deliver. Click here to view our birth announcement range. Our ordering process is simple, select a card, enter the text you would like printed and choose your font style colour etc. and upload your photo(s). If you need help with our ordering process please click here or on the frequently asked questions link above under about us. Your photo's will be cropped and positioned to give the best possible result. If asked we can even "photoshop" if a little image adjustment is requested at no extra charge. We typeset your card and send you an acrobat proof to review and approve within hours of receiving your order. We will adjust our templates if required to suit your requirements. Offering this service allows you more freedom with your announcement card's text layout, fonts and color. Please enter all of the information you would like on your card and your specific instructions if you have any. You can upload your photo(s) directly to our server after completing your order. After your order is received, one of our designers will personally create your card. You will be be emailed an acrobat proof within 1 working day. Often within a matter of an hour or so if ordered during the week. We are flexible - if you want to see a card with a couple of different photos - just ask. It's what we are here for! If you like a design but want a plain background or a different colour frame - just tell us and we will make it for you. if you want some cards with a printed reverse and some blank for your own message - just say. If you want a physical proof before proceeding - you got it, ...just ask. After completing your order we will send you an Acrobat (PDF) & we work to despatch all cards on the day of approval. Click here to browse our range of announcement cards or click on the links above. Click here for our Testimonials page - we are, if possible, as proud of our cards and the service we provide as you are of your new arrival. www.shoutaboutit.co.uk - Unique designs, fast turnaround and low prices on birth announcement cards, christening, naming ceremonies and party invitations, change of address cards and photo christmas cards. All prices include free UK delivery and quality envelopes. www.shoutaboutit.co.uk covers UniteUKd Kingdom, London, Eire, Birmingham, Manchester and Bristol : - custom christmas photo card - birth announcements.